Foreign Minister Mohammad Javad Zarif made the remarks in an address to Tehran Security Conference on Monday. The one-day event – held under the banner of ‘Regional Security in West Asia; Emerging Challenges and Trends’ – is the second of its kind organized in the Iranian capital. 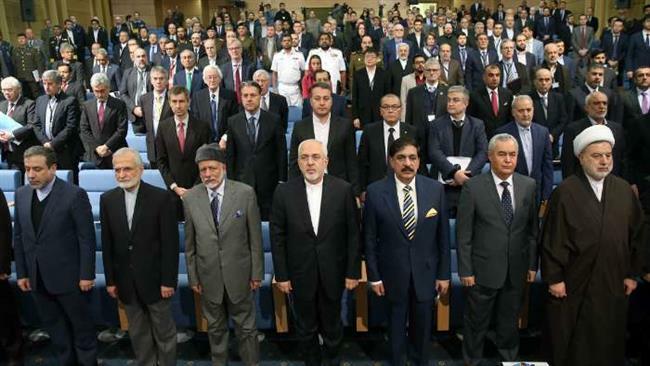 More than 200 Iranian and international political figures and analysts attended the conference. Zarif blamed the Saudi-led military invasion of Yemen as “one of the key factors creating tension in the region,” adding that after engaging in 33 months of futile warfare, the invaders should have come to the realization that there exists no political solution to the Yemen crisis and that negotiation and consensus alone can contribute to the ultimate resolution of the crisis. Leading a coalition of its allies, Saudi Arabia launched the offensive to restore its favored government in Yemen and crush the popular Houthi Ansarullah movement that has been defending the nation against the invaders. However, it has fallen short of achieving either goal. Instead, the military aggression has taken the lives of as many as 13,600 Yemenis and ruined the country’s infrastructure since its onset in March 2015. The Iranian top diplomat also denounced the US interventionist strategies as one of the most substantive challenges, further complicating the existing circumstances in the region. “The US is still ignorant of objective facts across the region, and insists on pursuing its destructive and tension-creating policies through its illegitimate military presence on Syrian soil,” he noted. Zarif pointed out to the continued occupation of Palestine as the most critical issue facing the region. “All issues are either directly or indirectly affected by this predicament, and the oppression that has been forced upon the people of Palestine over the past 70 years,” he said, and noted that Washington’s recent move to recognize Jerusalem al-Quds as Israel’s capital was an open declaration of hostility towards Muslims and an opportunity for extremism and terrorism to spread and prevail. He warned against any attempts at dominance by regional countries and the destabilizing impact of an escalating arms race. Zarif noted that compared to the rest of the world, Iran’s neighbors in the Persian Gulf have the highest proportion of military budget to their gross domestic product. Elsewhere in his remarks, the Iranian foreign minister highlighted the fact that — despite its losses in Iraq and Syria — the Daesh Takfiri terror outfit is still active in parts of the world, and called for efforts to defeat extremist ideologies and cut their finances. He referred to post-Daesh reconstruction of Iraq and Syria as one of the key responsibilities of the international community, adding that such reconstructive efforts would help bring about political stability and quell extremism. The senior diplomat also recalled Iran’s proposal on the formation of a Persian Gulf dialog center, adding that in the current day and age, there is a need for negotiation and trust-building measures more than ever before. Tehran attacks ‘a Saudi-Israel-US project’: IRGC cmdr.